I found an old trunk in the attic of my new house. Ironically, my new house is actually a beautiful old farmhouse. It’s 120 years old to be exact. I often imagine who might have lived here 120 years ago. There are two front doors. One is the original front door and the second is the old back door that was removed from the rear of the house when it was restored six years ago. The original front door has the letter ‘G’ scrolled on the front. I imagine the ‘G’ family that once lived here all those years ago. I imagine the children running through the house on a hot summer day screaming and laughing, as their mother called after them to go outside and play. There is a large back yard that borders the huge brick farmhouse next door. A massive tree, most likely 100+ years old itself, connects our yards. And across the road, two farms are the home to forty or fifty-plus cows, peacefully grazing. So back to the trunk. “I don’t know,” he replied. I moved toward it and almost as in slow motion, I reach my hand out, ready to open it. But then I stopped. In such an old house I wonder how old must the trunk be? And all I can imagine is ghosts are locked away in the trunk. Yes, it’s silly, I know. 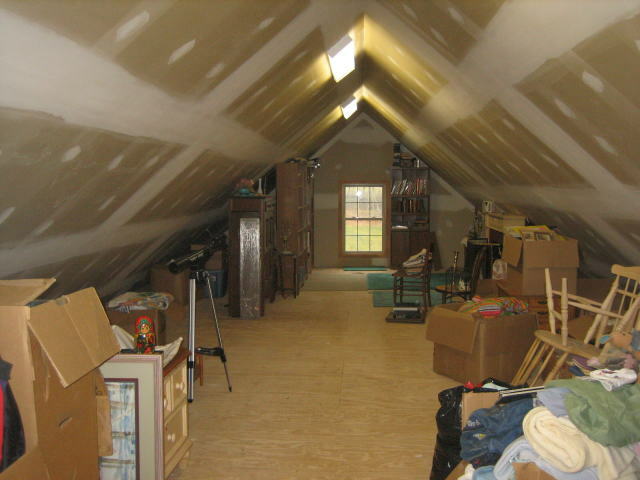 So I backed away and headed back down the narrow stairs, closing the attic door behind me. The attic door itself is a bit unusual. And I am certain it’s the original door. It faces the hallway connecting the master bedroom to the master bath and you have to pass it each time you are in the bedroom. A week later, I moved into my beautiful new, old house. The movers helped me move a few things into the attic. It was sunny that day and the bright light shined through the small attic window. But yet, it still felt a bit dark. And there stood the trunk. Still unopened. Still a mystery to me. I hesitated and looked at it from the top of the attic stairs, wondering what could be inside? Again, I decided not to open it and went back downstairs. When you live in an old house, it’s almost impossible not to imagine that perhaps ghosts or spirits live there, too. But it wasn’t long after we moved into our wonderful old farmhouse that I realized that if there really were ghosts living with us, they had to be friendly ones. The only noises that I hear late at night are the ones my cats make as they stretch during their sleep. Or the soft padding of their feet on the freshly waxed hard wood floors. And sometimes when I think I hear something odd, I stop to listen. Only to realize it’s just the sound of the November wind reminding us that winter is almost here. And although the house is large and quite old, I feel very safe and happy here. There is something very calming and peaceful about living in the country. It can’t quite be explained unless you have experienced it for yourself. How could such a charming and beautiful old home have anything but friendly ghosts? It’s only been a few weeks, but between working, unpacking and trying to organize my new life, I find my days are quite full. There’s no time to explore abandoned trunks or old attics. And so the trunk will have to wait. For now anyway. And maybe when the spring and the longer, warmer days arrive, I’ll decide to open it then. I love your words. I love the visuals that come from them. I love your spirit. Be blessed as you are a blessing to many. Do not go back into the attic! It’s haunted, baby. wait, you haven’t opened the trunk? how could you not have opened it yet. Ugh curiosity would have killed this cat a long time ago.